Ezra’s missing but not forgotten. Image: All images: Disney XD. 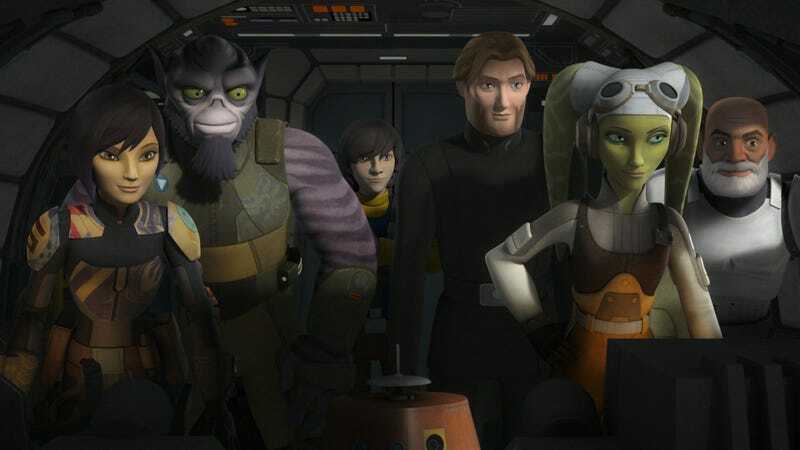 If you’re like us, your head is still spinning after the series finale of Star Wars Rebels. There’s so much to digest, not the least of which is that the show is finally over. So what questions did it answer? What mysteries were solved? And what’s next after that cliffhanger ending? Well, here’s everything we know, along with everything we can figure out. Did the Rebels free Lothal? They did. Ezra’s first goal from the first episode of the show has always been to get the Empire off his home planet. It took some time, and becoming a Jedi to do it but, thanks to him and the rest of the team, the Empire was defeated, and Lothal became a free planet. After the Battle of Yavin, the Empire was too busy fighting the main forces of the Rebel Alliance to retake the planet, but Sabine Wren stuck around for many years to make sure. Hera is one character we know for sure played a role in the original trilogy. Sort of! Well, besides Kanan, but that happened a few weeks ago. Hera, Zeb, Sabine, Rex, Ahsoka, Chopper, and Kallus are still standing after the events of the finale. But the finale didn’t pass without at least a couple of significant deaths. On the heroes side, we lost Gregor, one of the clone trio, while the Empire lost both Governor Pryce, going out in a hail of defiant glory as the Imperial Dome exploded, and Rukh, Thrawn’s Noghri bodyguard, who got frazzled in his fight with Zeb. And then there’s Ezra and Thrawn, who didn’t die, but whose fates are left very, very mysterious. Mon Mothma was one of the most fun cameos in Rebels. Where are all of the Rebels characters during the Original Trilogy? Hera Syndulla, along with Chopper, fought with the Rebellion during the original trilogy, up to the Battle of Endor. The same goes for Commander Rex. As mentioned above, Sabine stayed on Lothal to watch over the planet to make sure the Empire didn’t come back. She even stuck around for several years after the Battle of Endor, presumably because there was still a remnant of the Imperial forces kicking around. However, about five or so years later, Ashoka visited her on Lothal, and they went on a journey to find Ezra. We don’t know exactly what Zeb and Kallus did during the timespan of the original trilogy, though it seems likely they fought along with everyone else. After Endor, though, they returned to the planet Lira San, which Kallus thought he had helped destroy. The Star Wars space whales called purrgil played a major role in the finale. What happened to Ezra and Thrawn? Ezra may have become a Jedi at the end of Rebels but what happened after that is a mystery. He captured Thrawn and used the hyperspace abilities of the purrgil (space whales, basically) to blast off to... somewhere. Around 10 years later, he’s still missing and Sabine and Ahsoka are on the case—however, it seems that we have confirmation that both Ezra and Thrawn are still alive. “I have a lot of theories about it and what I think happened and where they are,” Filoni said on Rebels Recon. “But I’ll say this much, they’re not dead. Both of them survive it.” Assuming Filoni is specifying that they’re alive at the time of the episode’s flash-forward, they will have been missing for around 10 or so years. What has Ahsoka Tano been up to? After meeting with Ezra in “The World Between Worlds” episode, Ahsoka Tano seemed poised to join her Rebel friends again... but apparently not. It’s possible that she stayed out of the war with the Empire because of her former master and his powers. What she was doing between the Rebels finale and her arriving on Lothal to pick up Sabine remains a total mystery for now. We are very intrigued by her new staff though. Is it just a staff or is it more than meets the eye? Sabine’s mural of her Rebel family. Why did Rebels end like this? Filoni explained how he came up with this ending instead of all the other possible endings out there. The difficult thing is there is so much story after the end of this part of the story. And I wanted people to understand, once they overthrew the Empire, there were expectations of a large battle that never happened because basically our story ends and then Scarif and the whole Luke Skywalker thing happens. When Luke happens, the Emperor’s attention is completely refocused... His fear of Luke Skywalker drives his attention away from Lothal so those people end up benefiting in the end. It was all a matter of timing, but I wanted to get to the part of the story that you understood the happy ending. So many people were obsessed with everybody dying [on this show]. I was really bewildered by it because I’ve seen the original trilogy of Star Wars that people like so much and it’s not like a death count type of movie. It’s a rather positive outcome, which I enjoy. I’ve always felt the best stories end and other stories begin and there’s no better way than to take two of my favorite characters and have them ride off into the sunset like I’ve seen in cowboy movies and Indiana Jones. And you just wonder, “What do they get to do? “I always like that in stories. One thing ends another begins, the story continues and that’s a saga. Jacen Syndulla, his mom Hera, and their droid Chopper. What’s up with Jacen Syndulla? Jacen Syndulla—yes, it’s totally spelled like that, a knowing wink to Jacen Solo, one of Han and Leia’s children in the old Expanded Universe—is the child of Hera Syndulla and Kanan Jarrus. He looks to be around 10-12 years old when we meet him briefly, which confirms the flash-forward to be taking place about 9-11 years after the Battle of Yavin. While the show says Jacen is a born pilot like his mother, he also had a Jedi father. When Jedi have kids, interesting things can happen. If he’s anything like his Expanded Universe namesake, though, Jacen is in for a galaxy of trouble—and making trouble for the galaxy, since Jacen Solo eventually became Darth Caedus, a new Sith Lord. Will any of these characters impact the events of The Force Awakens? All of those “Ezra is Snoke” truthers breathed a sigh of relief after the Rebels finale. With Ezra now in the wind through the Battle of Endor at least, his story could literally go anywhere. He could be Snoke, he could be one of Rey’s parents, he could be related to Broom Boy, who knows. The same goes for Ahsoka Tano and, well, any of the characters who are still alive. Where once we assumed everyone was dead because they aren’t in A New Hope, now we have to wonder if they made it to The Force Awakens, a few decades down the road from the flash-forward in the finale. Odds are, though, their stories will wrap up before then. There’s 30 years between the events of Return of the Jedi and The Force Awakens, which means Ezra would be nearing 50 by the latter. That’s a lot of time to cover. Ahsoka’s new outfits after Return of the Jedi. So will the next Star Wars animated series be about Ahsoka and Sabine looking for Ezra? From the final moments of the show, when Sabine goes off with Ahsoka to find Ezra, it seems pretty likely that story could serve as the beginning of whatever Dave Filoni is working on next. However, when asked about his next show after a screening of the finale Friday, Filoni was very noncommital. Who provides the voice of Chopper? Oddly, one of the show’s biggest mysteries has been the voice of the droid Chopper. (He’s always been credited as “Himself.”) Well, finally, in the credits of the finale, it was revealed that Dave Filoni himself provides the voice. Do you still have questions after the finale? Let us know below. *Correction: We had originally said Zeb and Kallus went to Lasan. They went to Lira San.